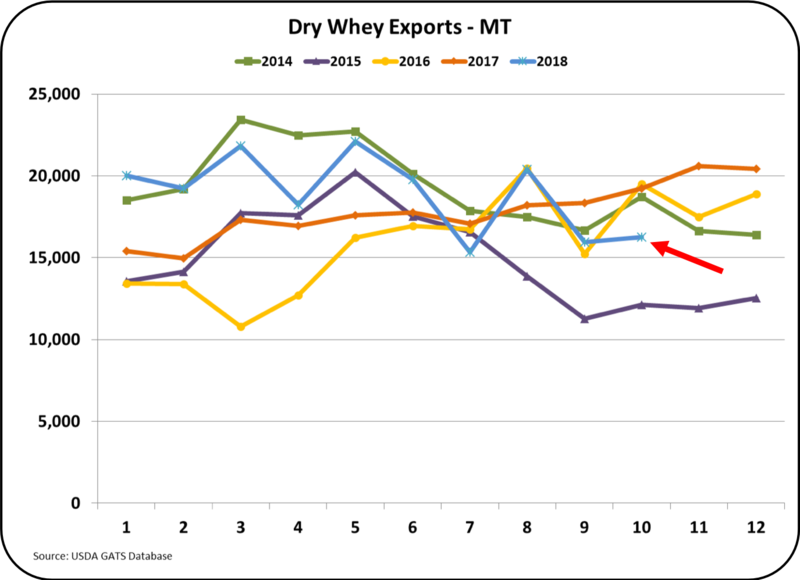 October Dairy Export/Import Data is Now Available. 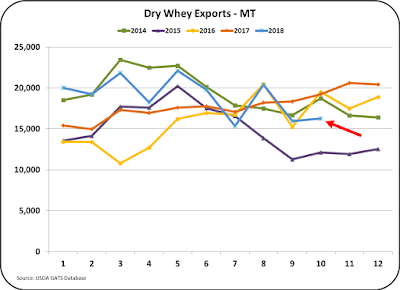 October Dairy Export/Import data was recently released. 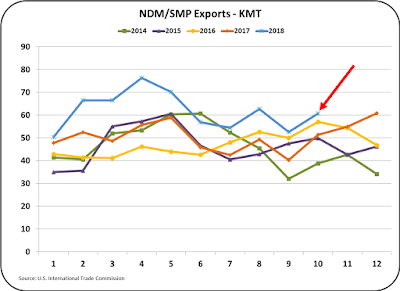 The most positive category sector is exports of Nonfat Dry Milk/Skimmed Milk Powder (NDM/SMP.) 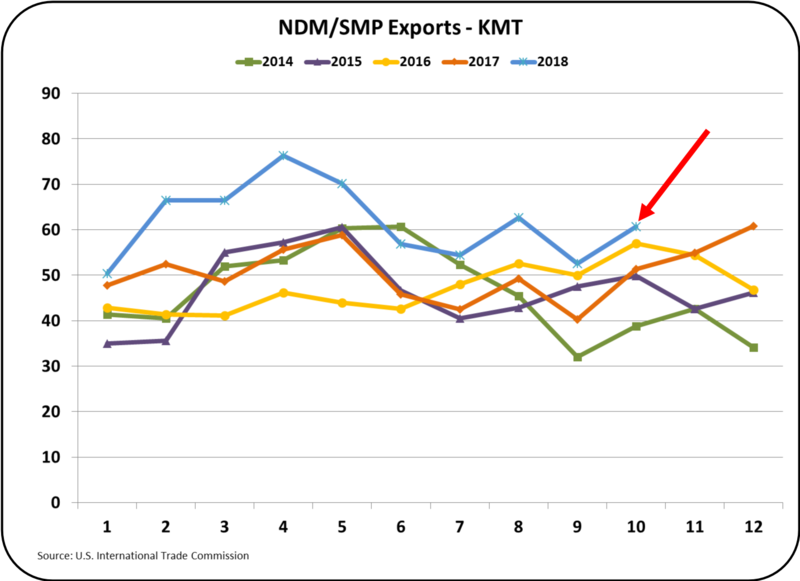 NDM/SMP export volumes for 2018 remain very high, with most of the product going to Mexico. 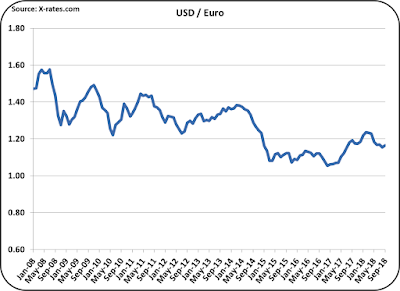 Exchange rates were also generally positive with a weaker USD. 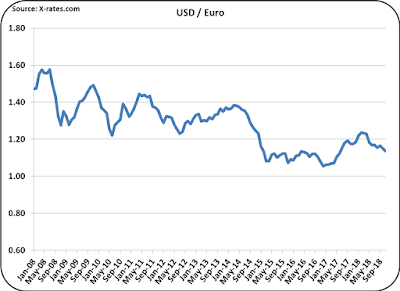 Other export data was not so positive. 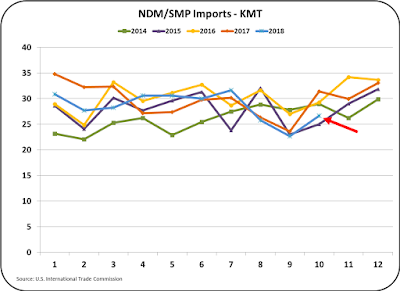 The four export products analyzed below are those that impact dairy producer milk prices; cheese, butter, NDM/SMP, and dry whey. The emphasis in this post will be net exports (exports-imports). 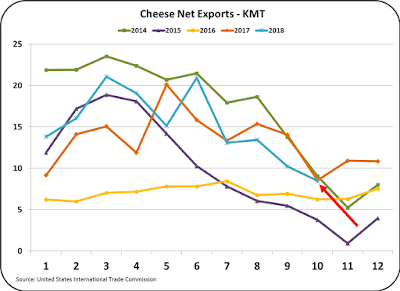 Cheese net exports (Chart I), are a very important as they impact inventories and cheese inventories control the price of producer milk (see prior post). 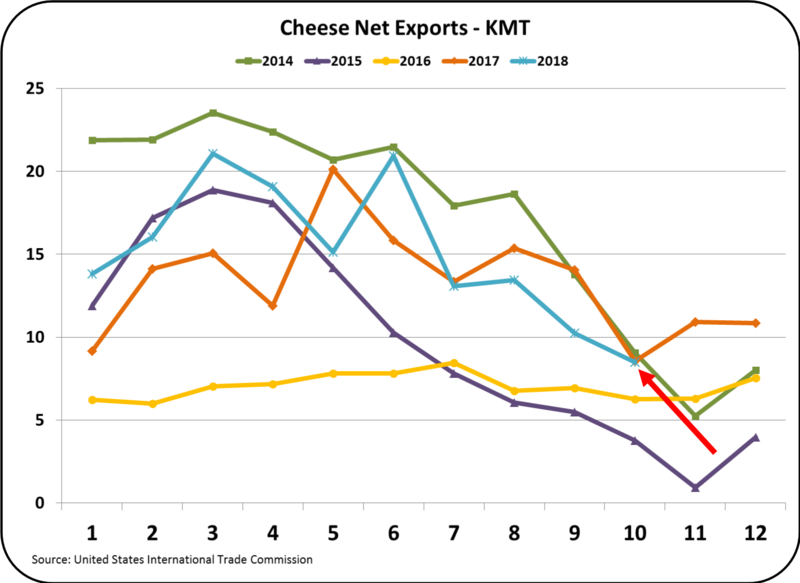 Cheese net exports for October are almost exactly at the level of 2014 and 2017 and somewhat above 2015 and 2016. Chart III shows where these imported cheeses come from, which are primarily from Italy and France. 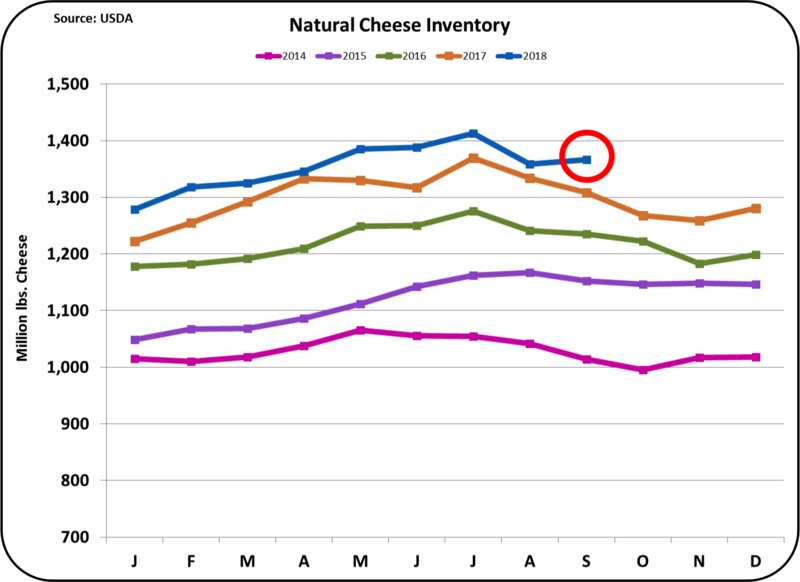 This shows the impact of specialty cheeses during the holiday season. By comparison, most all U.S. cheese production is commodity cheeses. 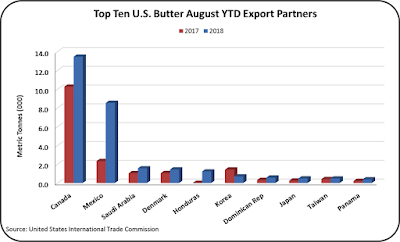 Butter exports and imports show a similar situation. Butter Imports are growing (Chart IV) and will likely continue to increase. Irish butter, which is cultured, has gained a significant position in the U.S. market (Chart V) as well as other international markets. 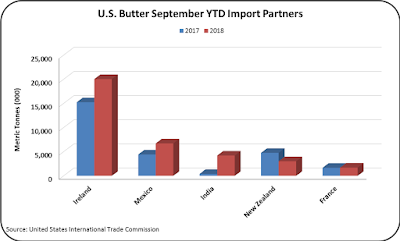 The concept of a "different" butter with unique characteristics was refined, branded, and marketed, and has had a major impact on Irish dairy exports. The Irish dairy cooperatives have led the effort. 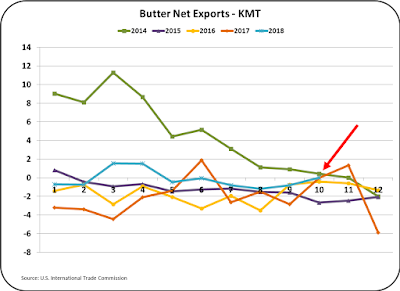 As a result, butter net exports (Chart VI) remain near zero. 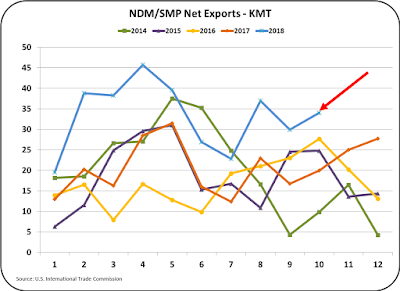 NDM/SMP is the bright spot in dairy exports. 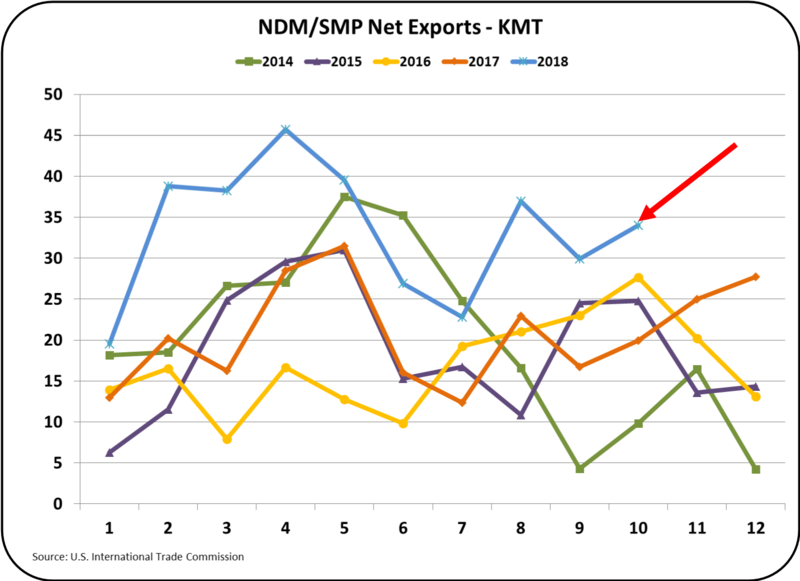 Net exports of NDM/SMP have been setting records most every month in 2018. And, the records being set are significant gains (Chart VII). 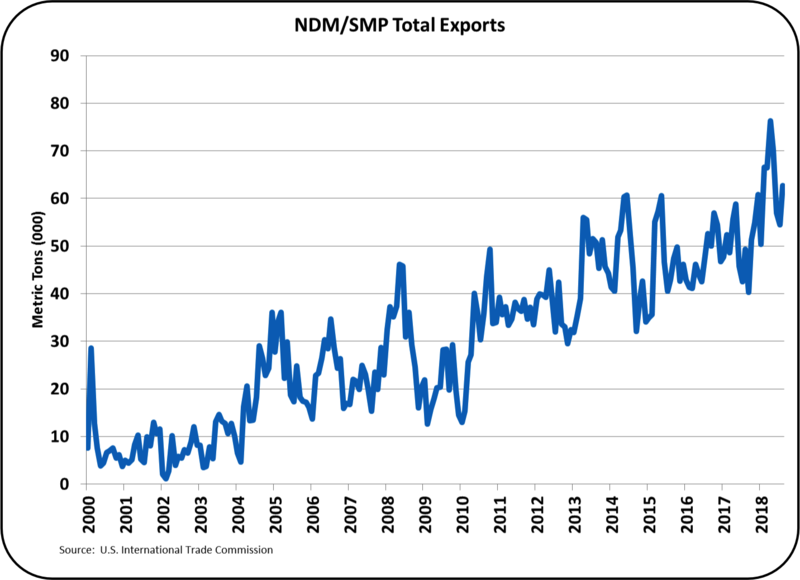 Exports of NDM/SMP have set new records in all but one month of 2018 (Chart VIII). 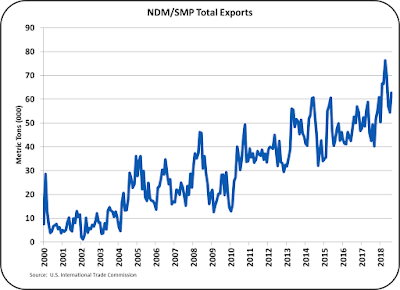 More than half of the exports of NDM/SMP are going to Mexico (Chart IX). It is a perfect product for areas that lack refrigeration and need low cost good nutrition products. 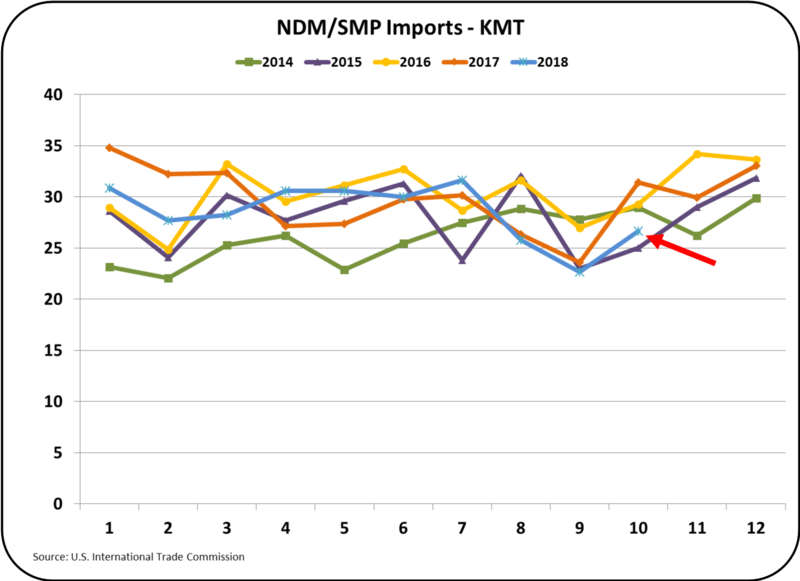 Imports of NDM/SMP are at a low. In September they were at a five-year low and were near a five-year low in October. 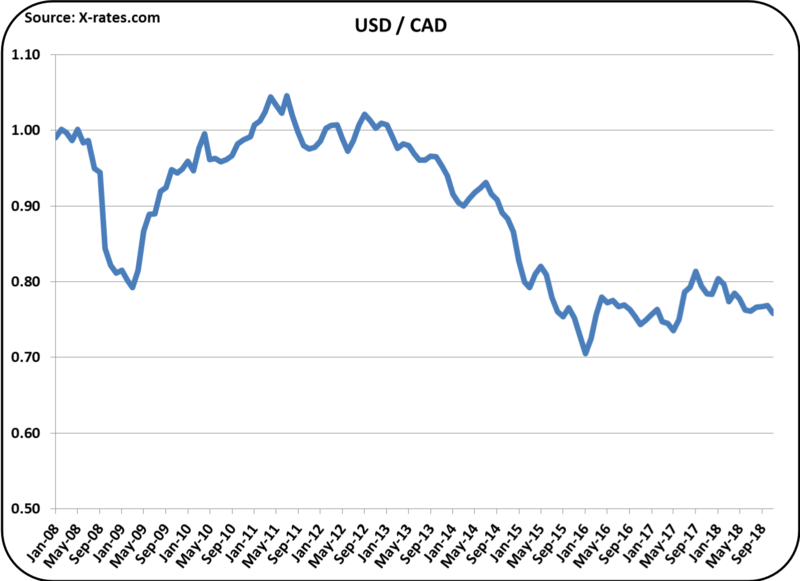 The imports are coming primarily from Canada at low prices. 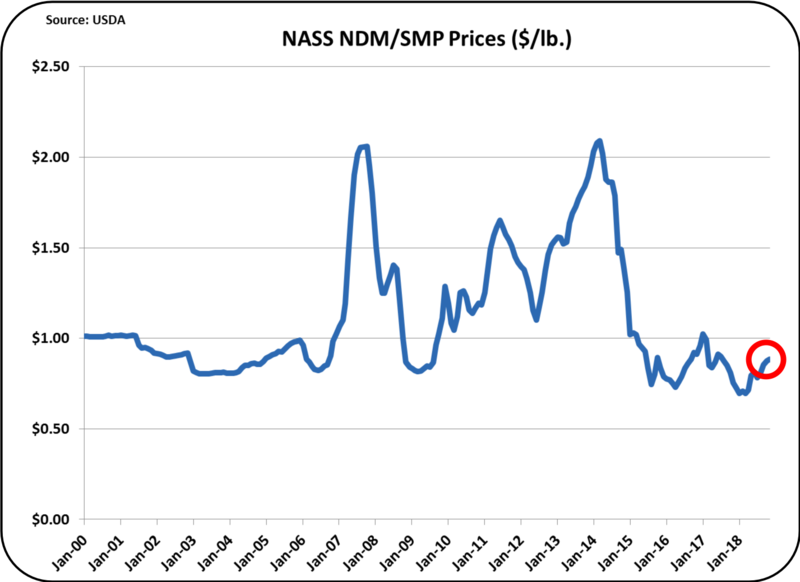 Due to increased butter consumption in Canada, there is a glut of skimmed milk which can be converted into NDM/SMP. 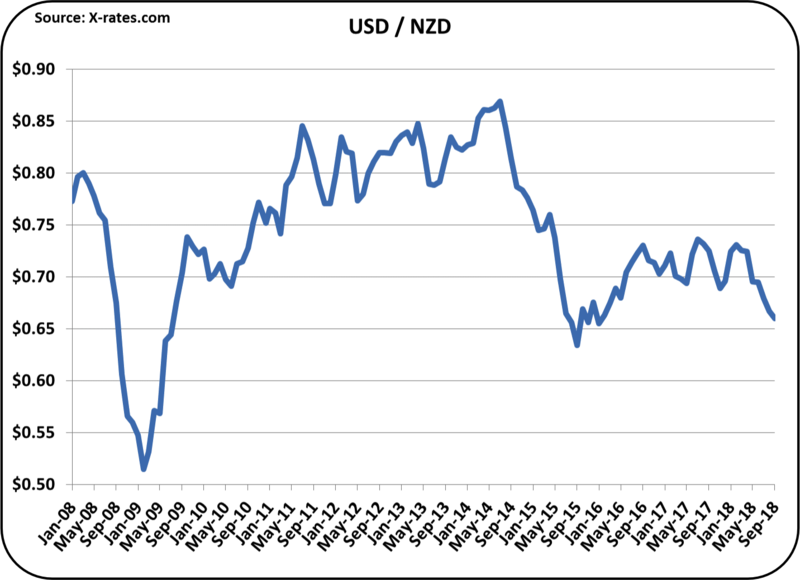 New Zealand has also been selling low priced NDM/SMP in the international markets. 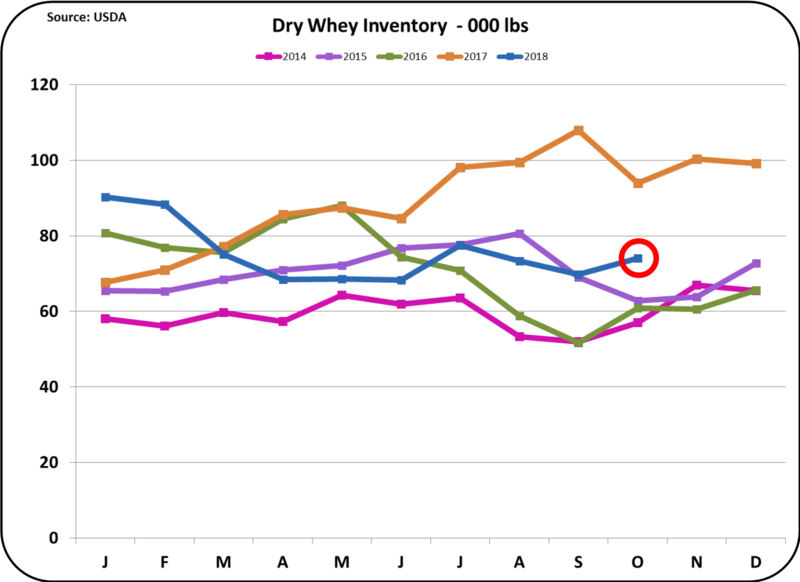 The final product to be reviewed is dry whey, which is the basis for pricing Other Solids. 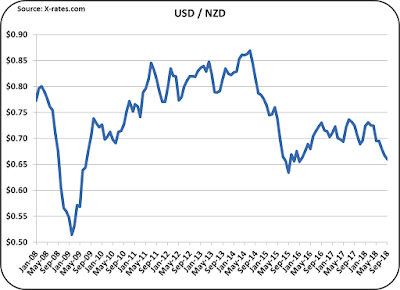 While exports are low, inventories are also low (see prior post). Not all whey is dried, and a significant amount is feed to animals in a wet form. 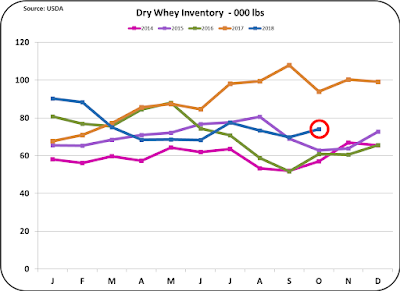 This helps keep inventories in balance and therefore even with low exports, the price of dry whey is reasonable. Exchange rates are currently moving in a favorable direction for exports. 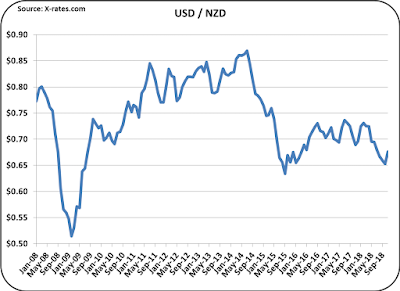 Only the exchange rate with New Zealand showed a stronger USD. 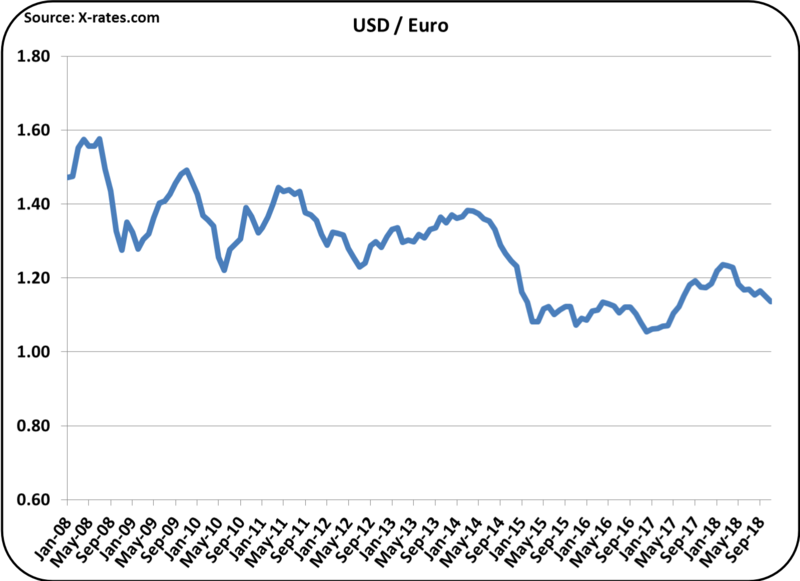 A weaker USD makes U.S. products more competitive in the international markets. The four charts below represent the two largest dairy competitors in the international markets, the EU and New Zealand, and the two largest U.S. dairy export markets, Mexico and Canada. 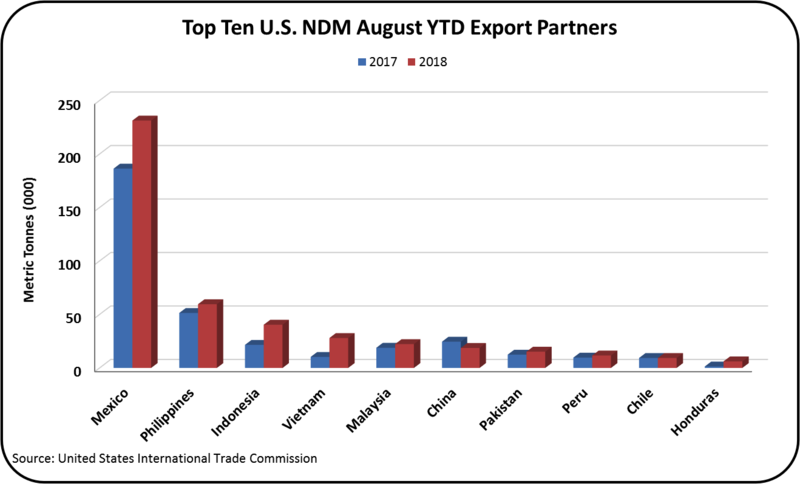 The USDEC should be congratulated on a positive 2018 for dairy exports. The challenge in 2019 is to increase exports of cheese to help reduce inventories and improve producer prices. November Class III milk and Component prices were released on December 5. 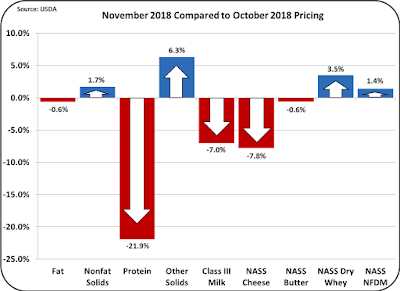 Milk protein and the Class III milk price were down considerably, and butter and butterfat were down slightly. The Class III price fell to $14.44/cwt., about 7% lower than the prior month and 14% lower than November 2017. 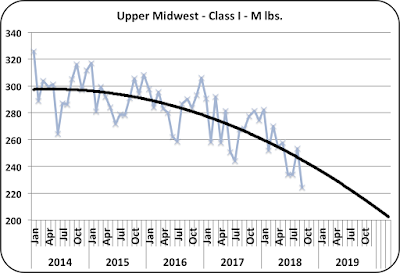 The Class III price remains within the tight pattern it has been in for the last four years. (See the November 11 post for more details on the "new normal." The data for the last four years shows no significant trends for improvement. 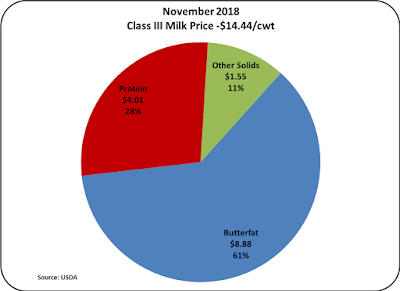 The November price of $14.44/cwt. 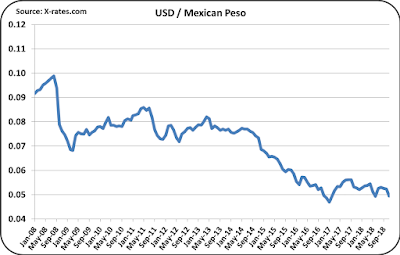 is in the lower quartile of prices over the period from January 2015 to the present. 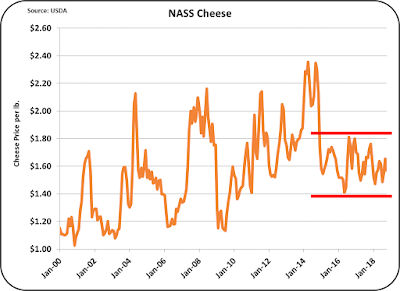 What is driving the low milk price is the high inventory of cheese being carried. 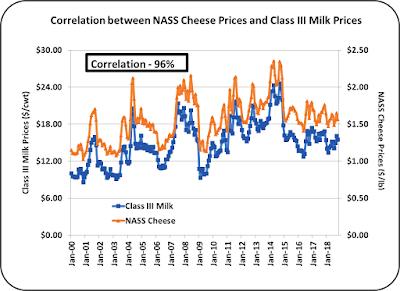 For the linkage between the cheese price and the Class III milk price see the prior post. 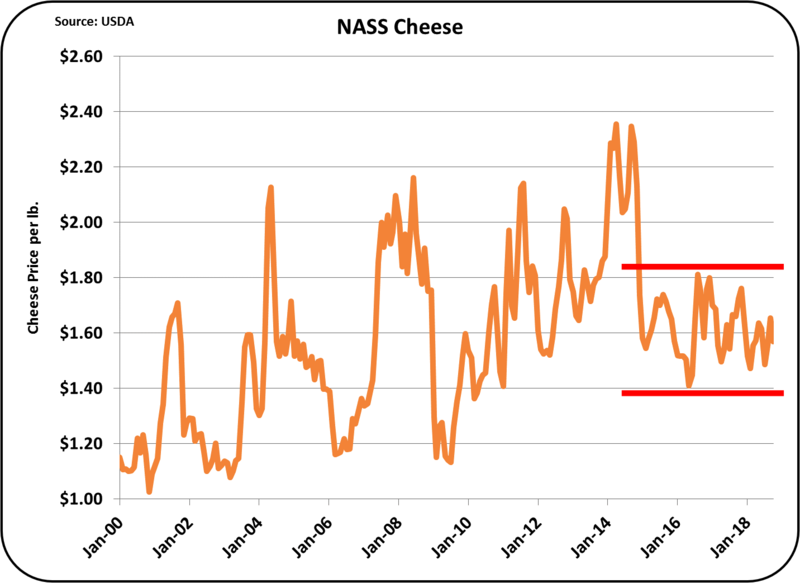 A case could be made that cheese prices could be worse based on current inventory levels. 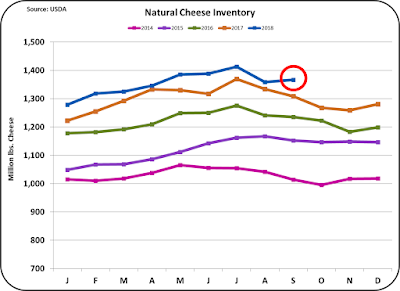 The long-term cheese inventory levels are shown in Chart IV. 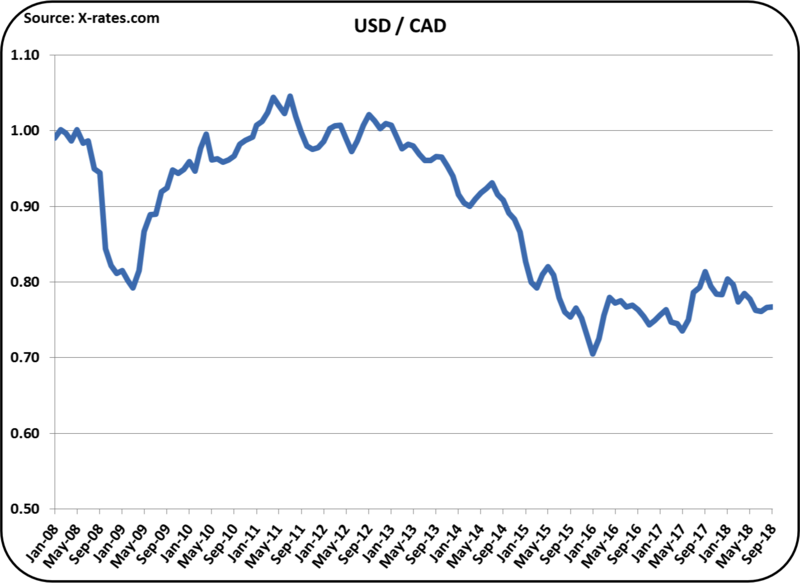 The trend line can be used to compare the current inventory levels to the "appropriate levels" represented by the trend line. 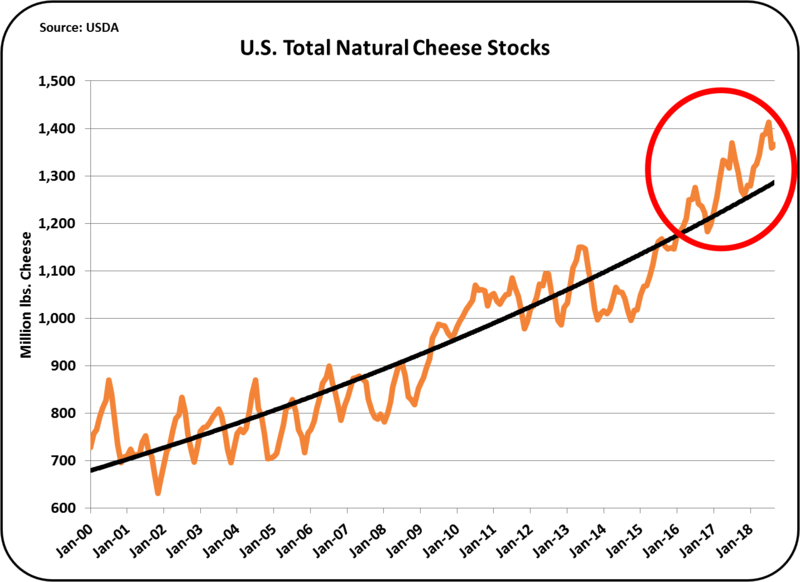 The growth of cheese inventories above the trend line is obvious. A case can be made that the cheese inventory levels are in the neighborhood of 50 million pounds too high. If changes are not made, it will continue to grow. 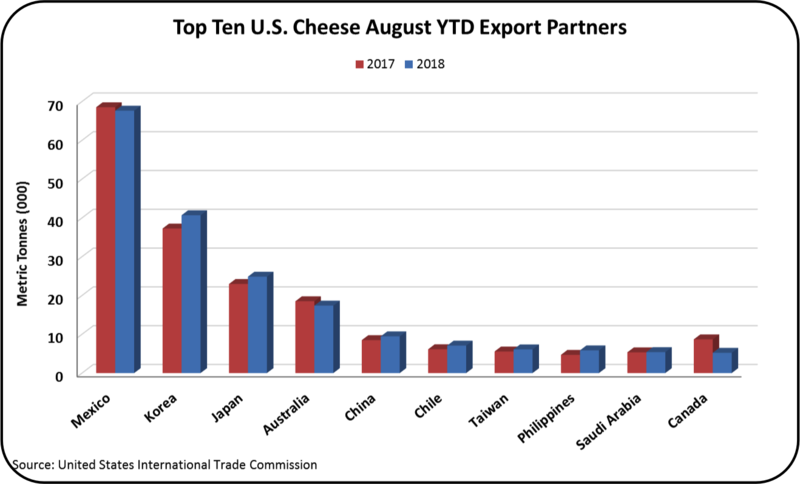 As reviewed in prior posts, exports of cheese are not growing. 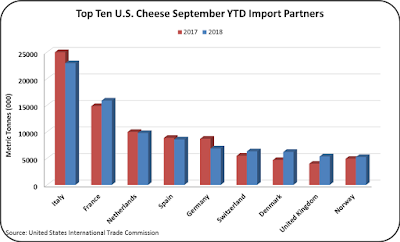 While there may be some impact from the current tariffs on cheese exported to Mexico, that impact could not begin to match the 50-million-pound bulge in inventories. Production is simply too high, and that production is being pushed by too much milk. 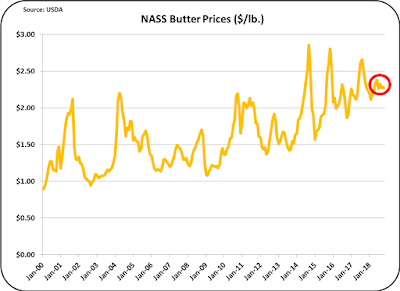 Butter prices remain in the higher level established starting in 2015. 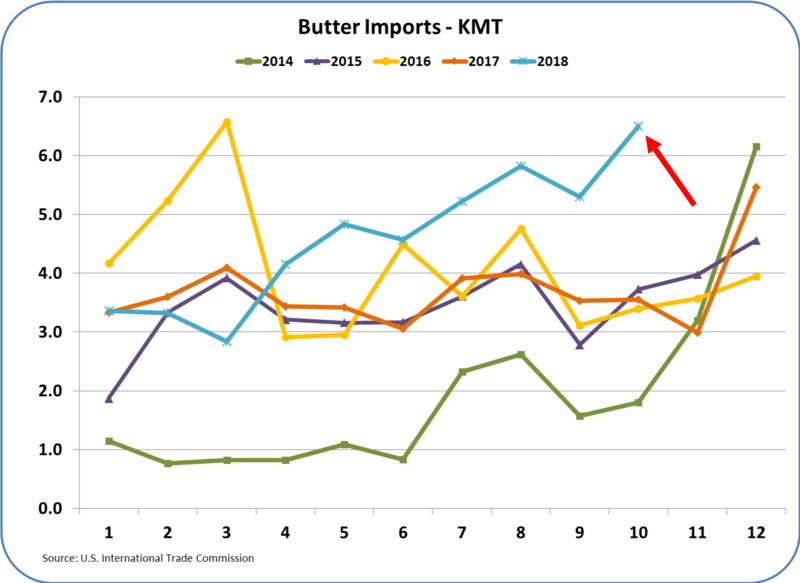 For 2018, butter has traded in a very tight pattern, ranging from $2.11/lb. to $2.38/lb. The current price of $2.27/lb. 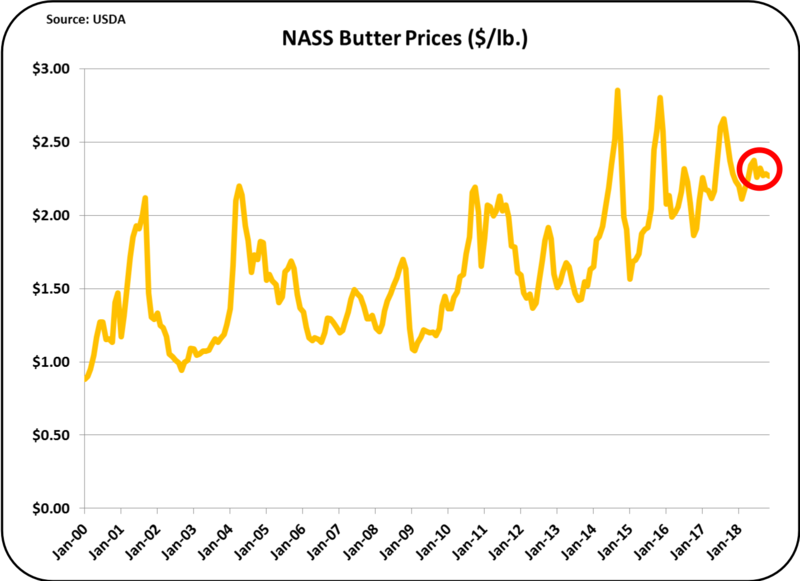 is near the midpoint of the four-year and one-year range in butter prices. 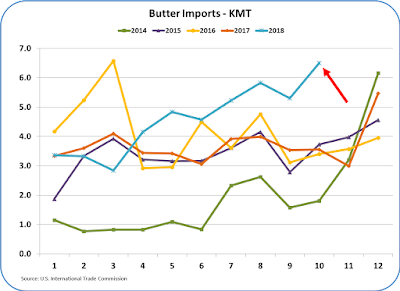 There was a very slight downturn in the butter price from the prior month which had very little impact on overall pricing. 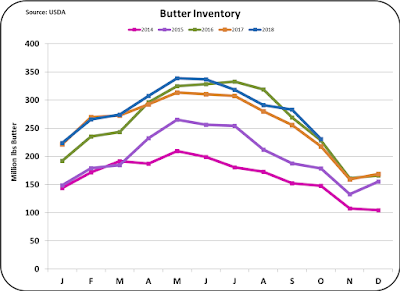 Butter inventories remains very close to the prior year in spite of the growing consumption of butter. The tight inventories remain very close to prior years. 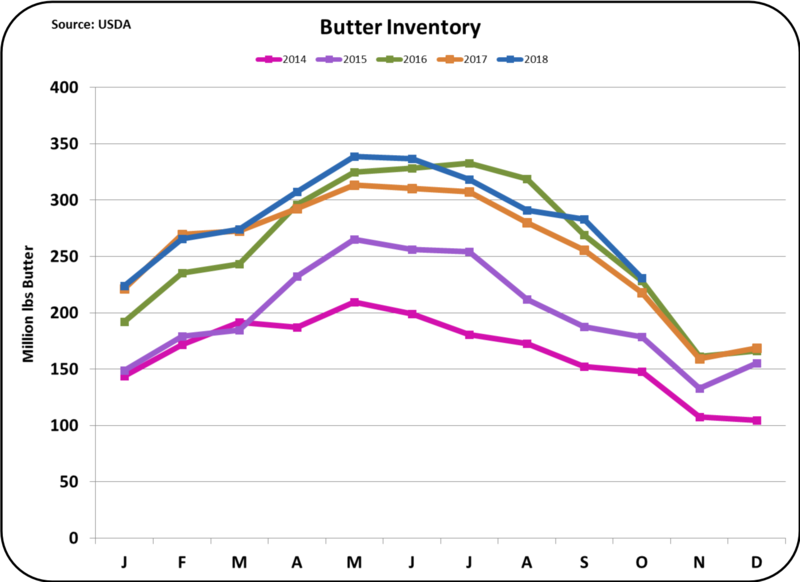 The tight inventories are keeping butter and butterfat prices high. 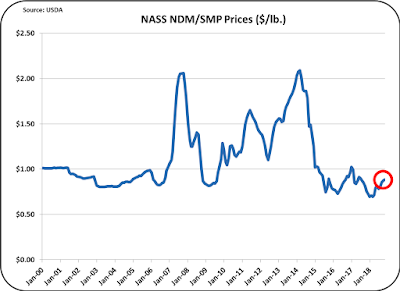 The Class IV skimmed milk price is derived from the price of Nonfat Dry Milk/Skimmed Milk Powder (NDM/SMP). 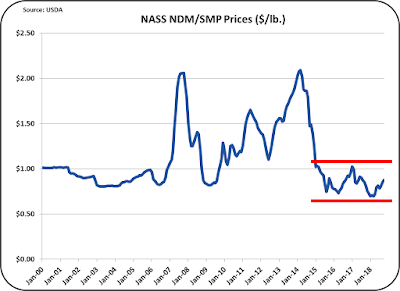 NDM/SMP increased slightly in price (Chart VII). 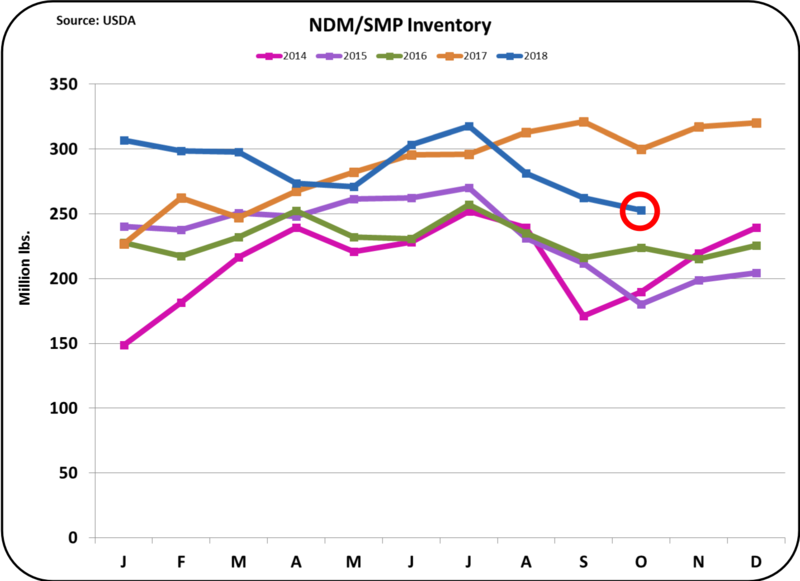 This resulted from the continuing drop in inventories of NDM/SMP (Chart VIII). 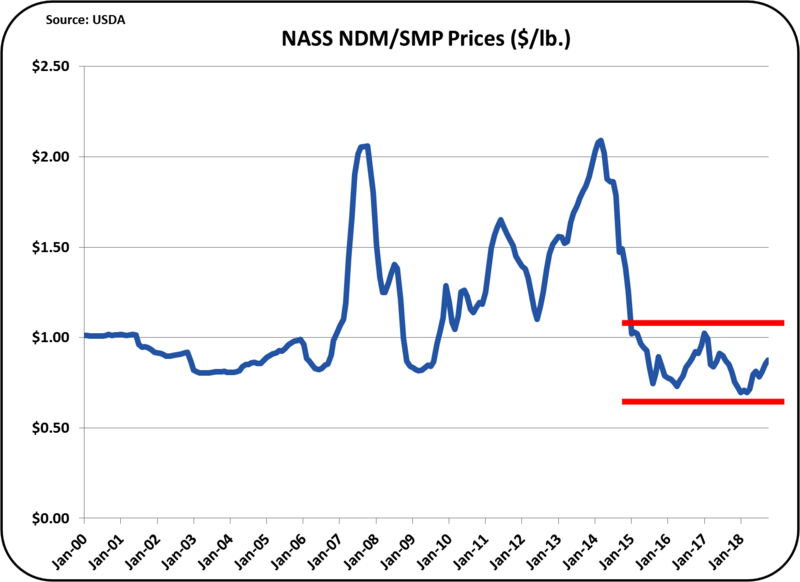 While the current price of NDM/SMP is still in the low-price range for NDM/SMP, it did increase the Class IV price enough to make it higher than the current Class III price (Chart IX). 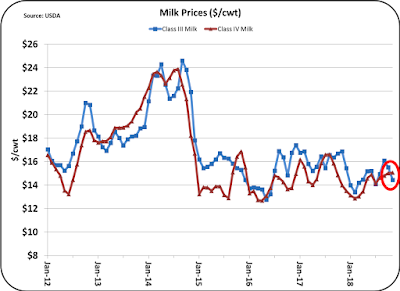 When the advanced Class IV skimmed milk price is above the Class III skimmed milk price, the Class IV price is used as the basis for Class I milk pricing. This in turn increases the uniform milk price and Producer Price Differentials and provides slight benefit for producer prices. The price of Other Solids has increased from a low $0.06/lb. 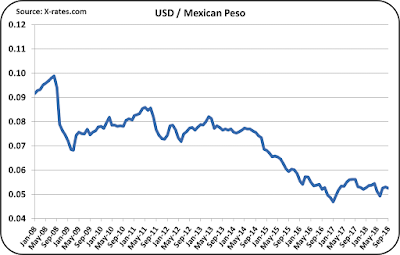 in early 2018 to $0.27/lb. in November. 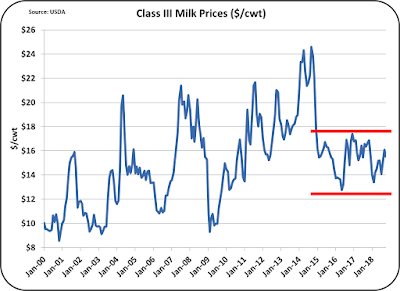 This has changed significantly the makeup of the Class III price (Chart XI). In November, Other Solids made up 11% of the Class III price. 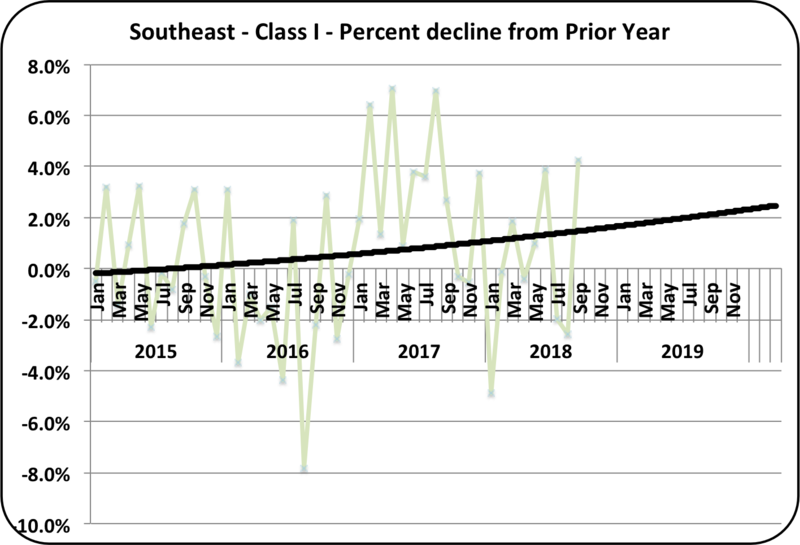 In January 2018, Other Solids made up only 3% of the Class III price. Chart XI - Component Contributions to the Class III price. Behind all of the price changes analyzed above, the level of inventories has been the primary cause. 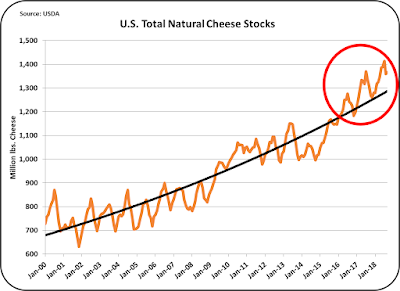 The biggest problem facing producer prices is the huge high inventory of cheese. 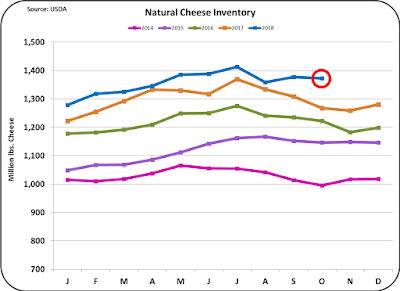 Producer prices cannot be improved until actions are taken to reduce the cheese inventory. Export/import data is now available through September. This post will deal exclusively with cheese analytics. 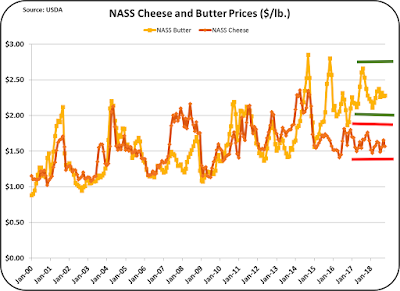 Cheese prices are linked very closely to the Class III milk price. This is illustrated in Chart I and the math behind this tight correlation can be viewed in the April 15 post to this blog. 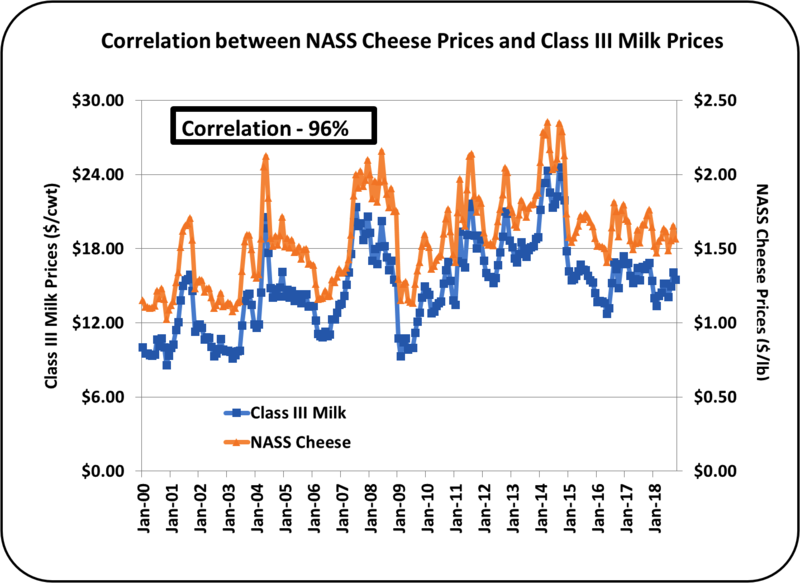 The data behind Chart I show a 96% correlation between the price of cheese and the price of Class III milk. 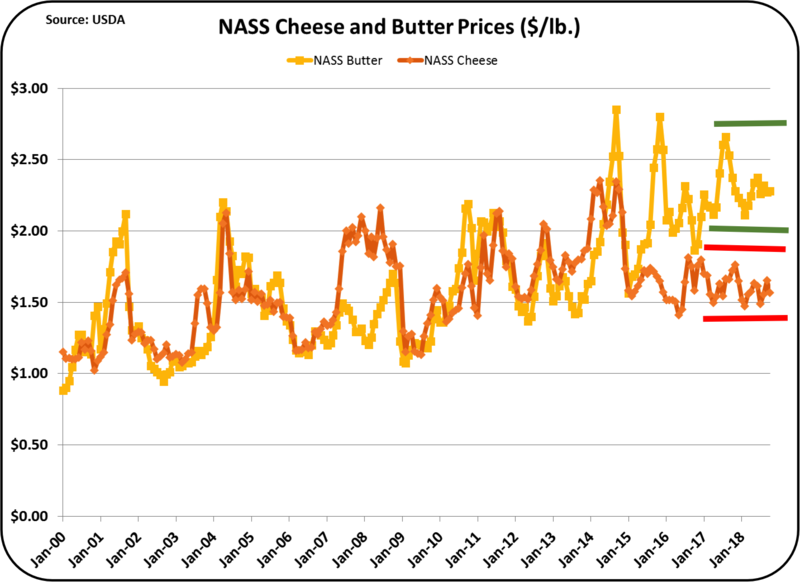 That means that 96% of the fluctuations in the Class III price can be predicted by the cheese price. 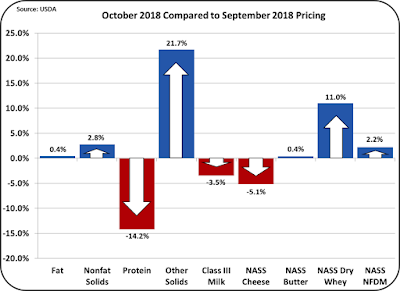 Because the price of cheese has been stagnant for the last three plus years, the price of producer milk has also been stagnant as covered in the prior post. The low price of milk is directly caused by the low price of cheese, and the low price of cheese is caused by the high inventories, which will be covered later in this post. 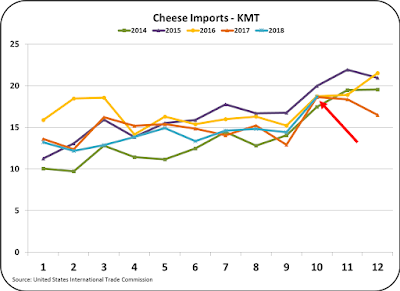 There are three elements that control the size of cheese inventories, domestic consumption, which is very predictable, cheese production that is covered later in this post, and cheese exports. 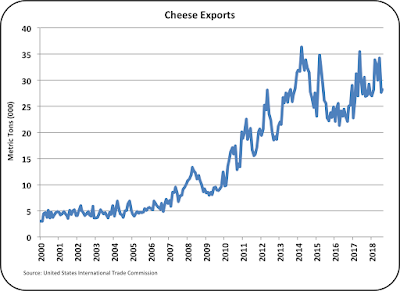 Chart II shows cheese exports by month over the last 18 plus years. 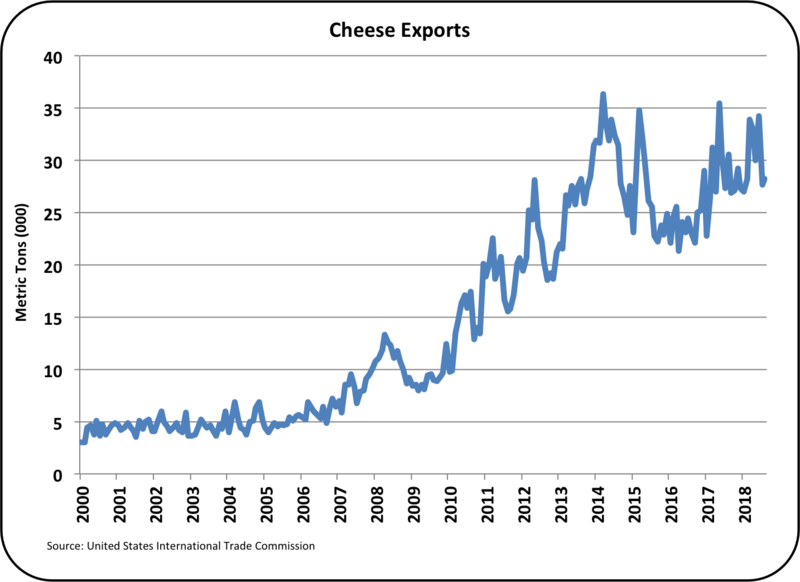 After a steady climb for 14 years, cheese exports have been stagnant. 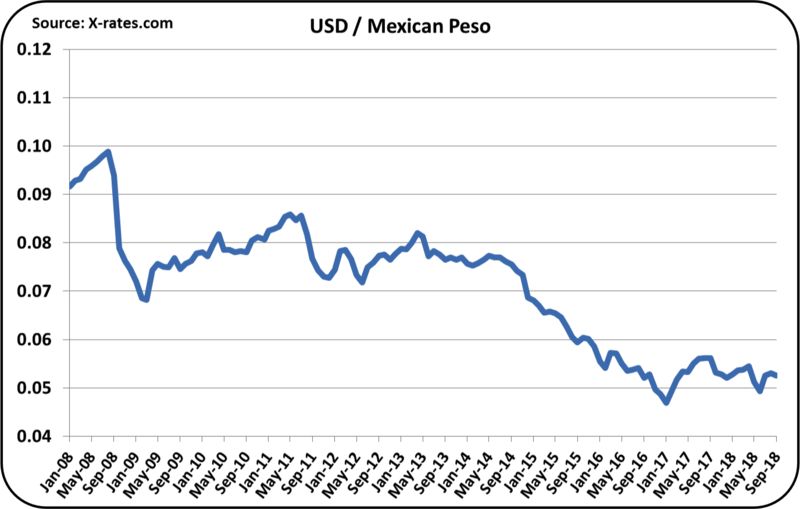 While there could be some impact from the newly implemented Mexican tariffs, the stagnant pricing covers a much longer period. 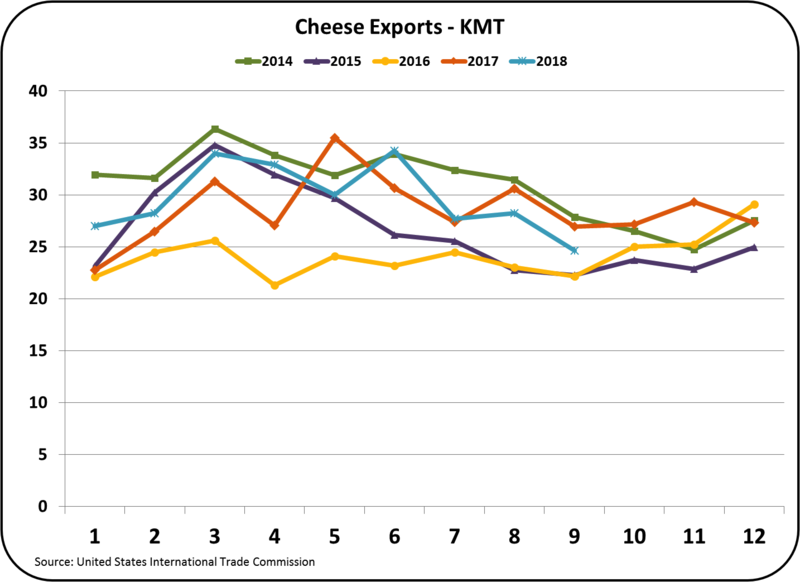 Chart III below shows the cheese exports for the last five years on a year-by-year basis. 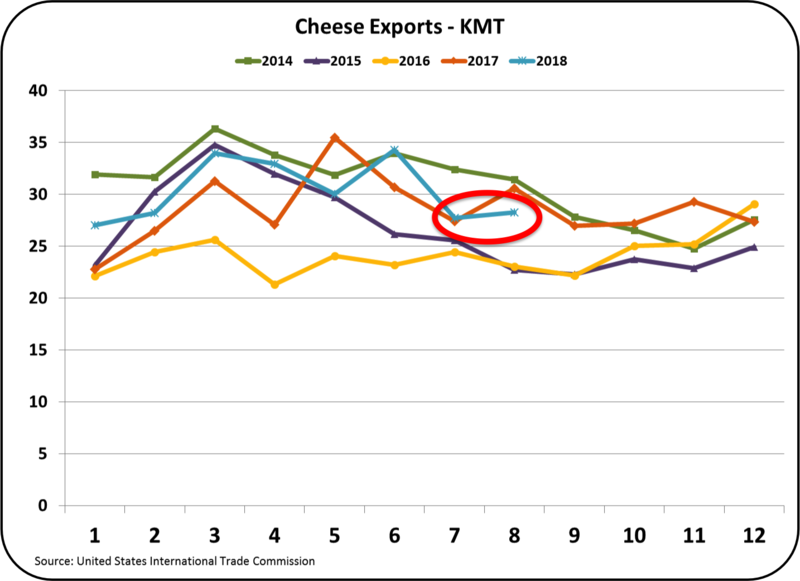 For the last two months, the cheese exports have been below the prior year and for September; the cheese exports are near a five-year low. Chart IV reviews the cheese exports YTD by country. 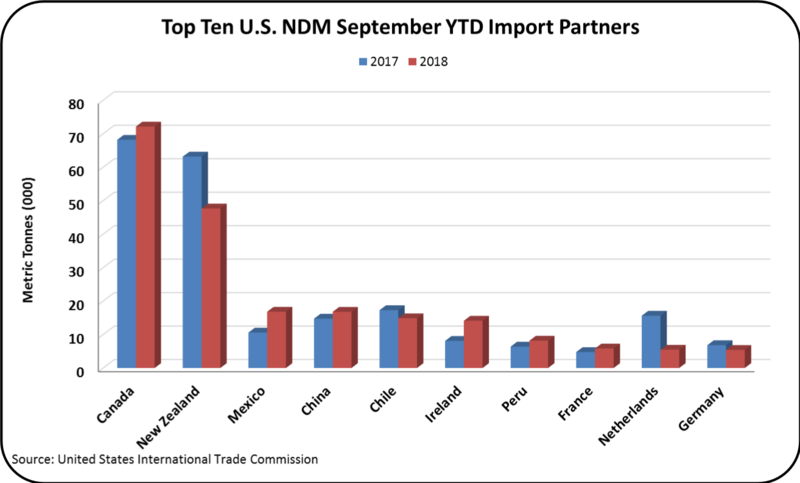 Mexico remains the largest importer by far. 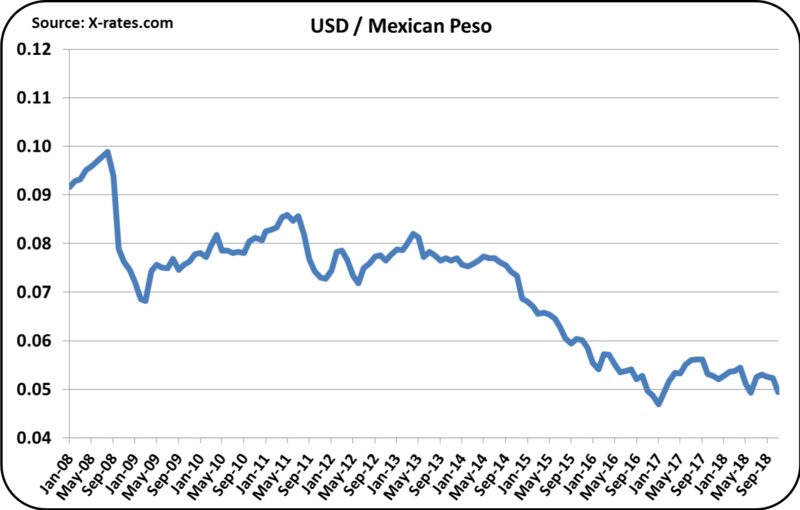 Imports of cheese to Mexico are virtually flat vs. the prior year. 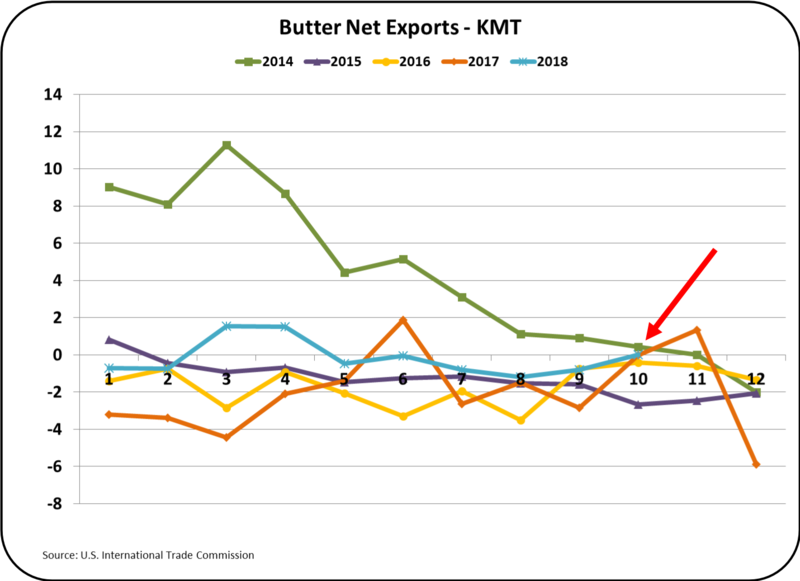 A few other countries like South Korea have purchased more this year, but those increases are small and largely offset by losses in other countries. 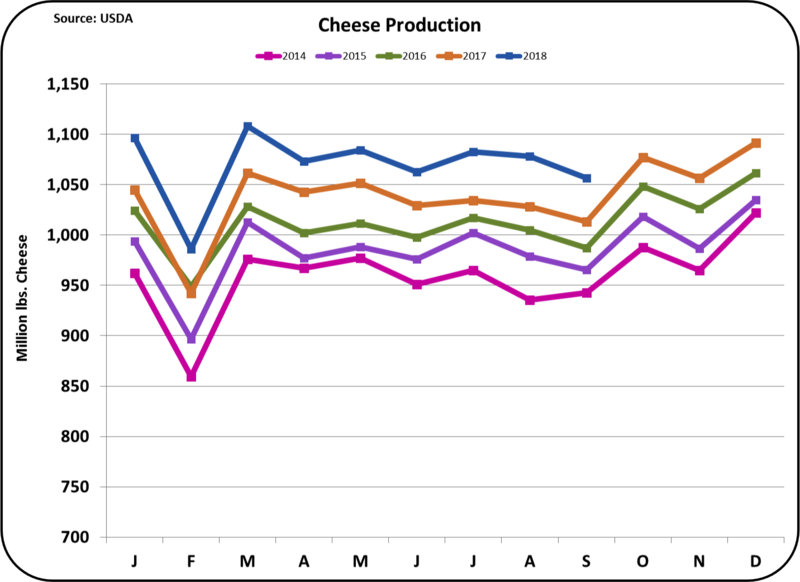 Cheese production (Charts V and VI) has raced well ahead of prior years. The data in Chart V shows an increase well ahead of the prior year. 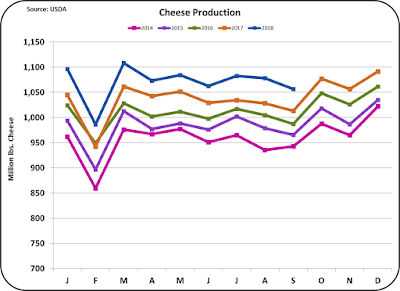 Chart VI shows that for the last three years production has been well above the long-term trend line. 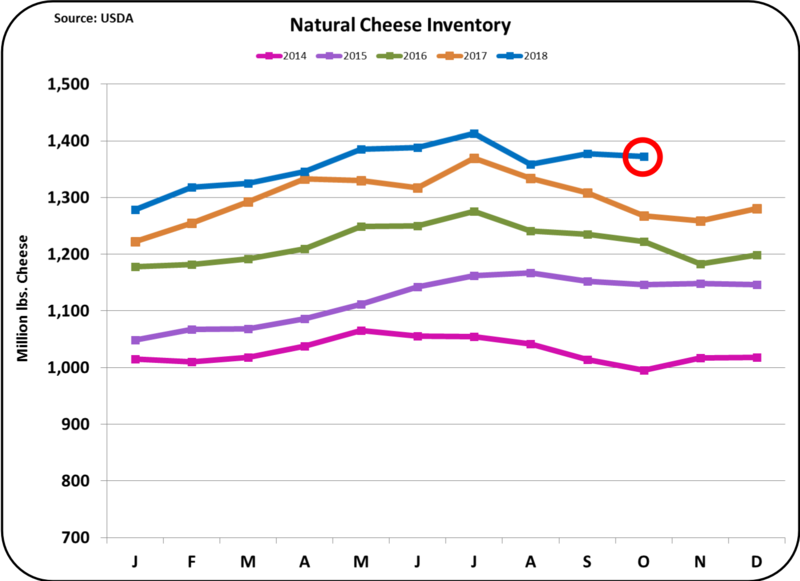 As a result, Inventory levels have risen well above those needed to support the domestic increase in cheese consumption. 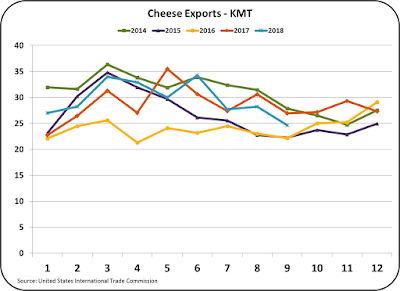 With these analytical charts, it is clear that the problem of low producer milk prices centers around over production of cheese and lagging cheese exports. The over production of cheese is somewhat caused by too much milk. The lack of cheese exports is a little more difficult to explain. 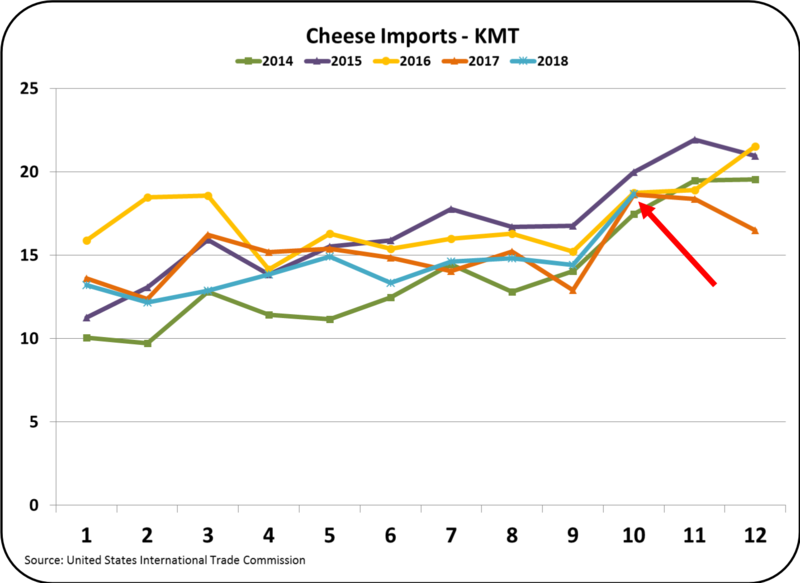 Certainly, there is some impact from the Mexican cheese tariffs recently imposed. 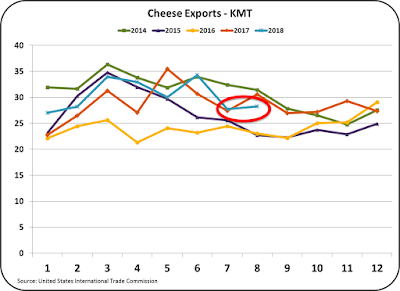 However, the stagnant cheese exports are a problem of a much longer duration. October Class and Component Prices were announced October 31. 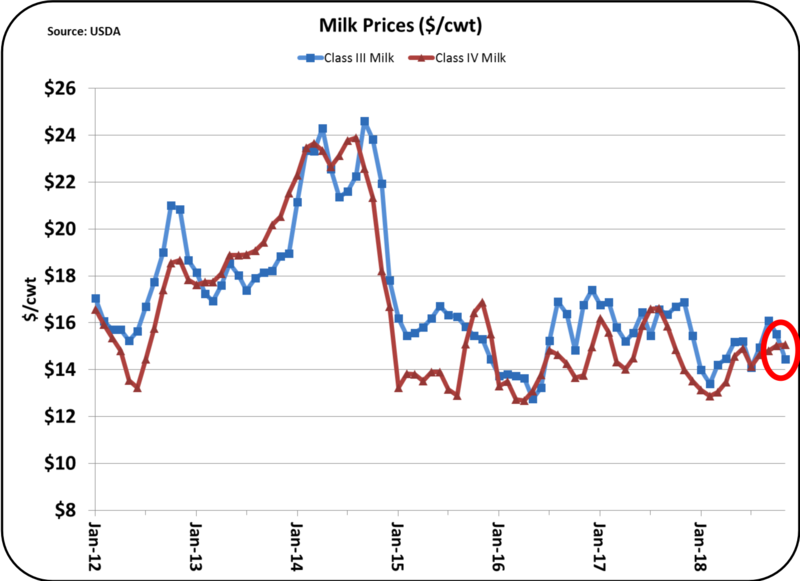 Prices were mixed resulting in a 3.5% drop in the Class III price to $15.53/cwt. That is a pretty normal price based on current history. 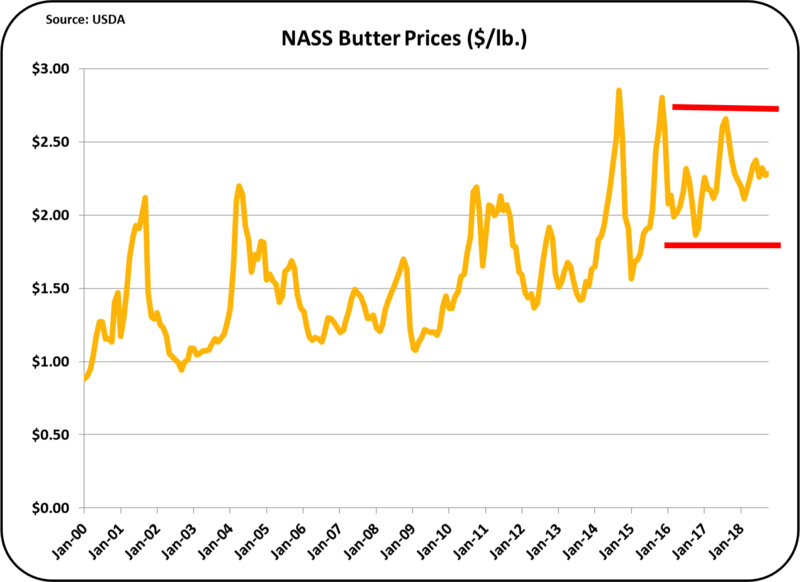 This post will review the "new normal" for milk and component pricing. 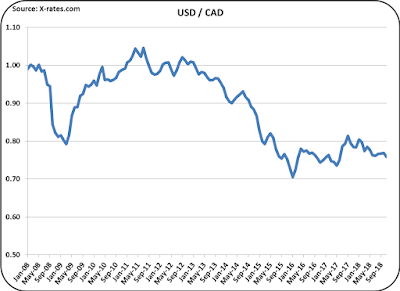 Prices have been fairly consistent for over three years. 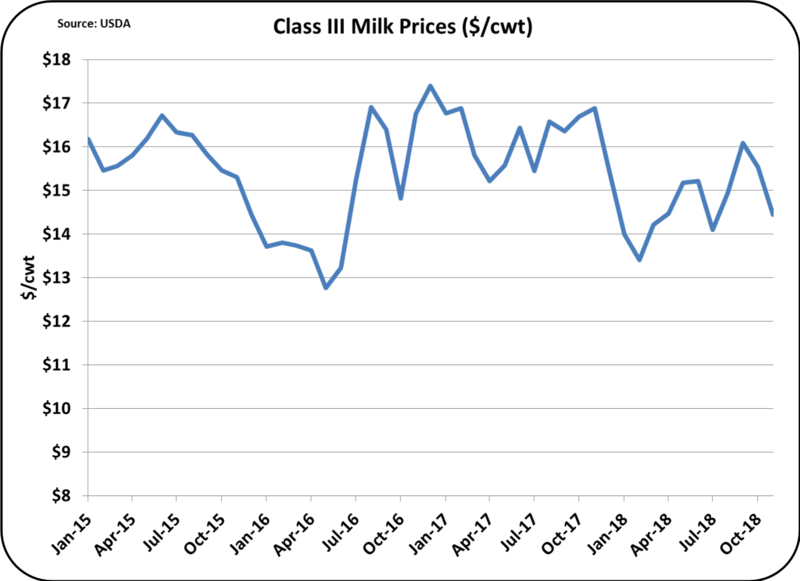 A quick review of Class III milk prices (Chart II) shows that for over three years the price has been in a fairly tight range from about $13/cwt. to $17/cwt. Currently, at $15.53/cwt. the price is near the midpoint of the range. 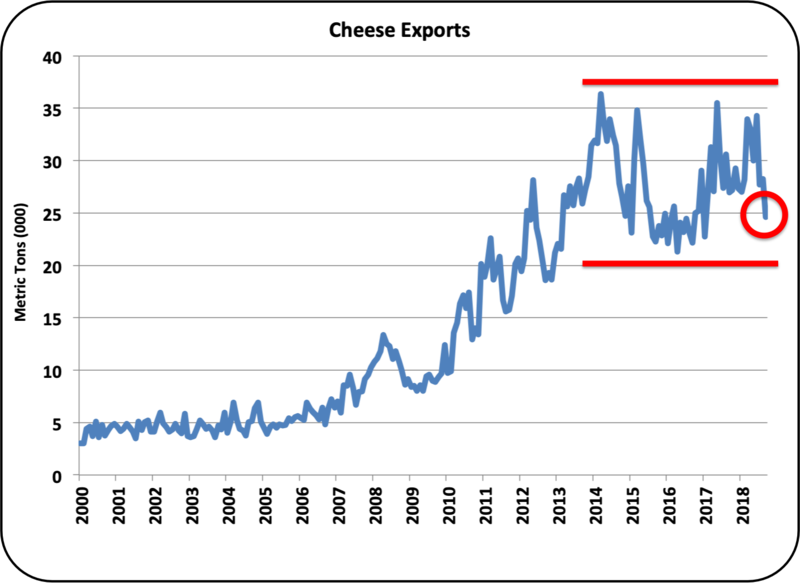 Compared to Class III price movements in the past, this is a very long time for prices to be in such a tight range. 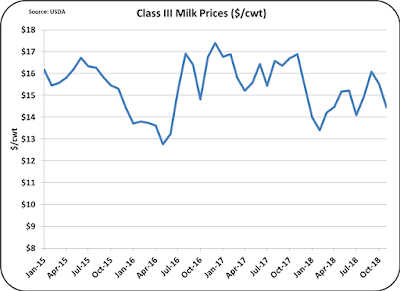 Considering inflationary adjustments, the price of Class III milk is at a low and is staying there for a longer time than ever before. 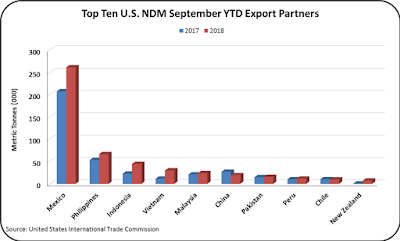 The reason behind the current circumstances is simply, too much milk, too much cheese in inventory, declining consumption of fluid milk, exports that don't seem able to export cheese, and increased consumption of butter, which leaves a lot of NDM to be disposed of at lower prices. 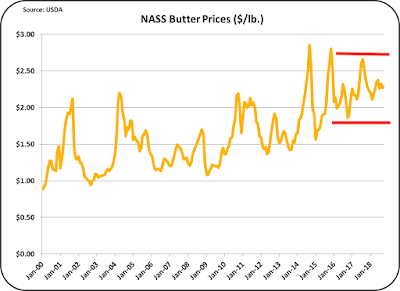 It is the perfect storm of financial issues for the U.S. dairy industry. 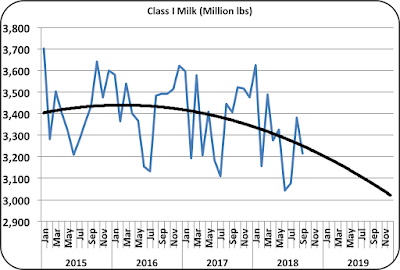 Will the volume of producer milk quit growing and perhaps shrink? Low milk prices are forcing some producers out. 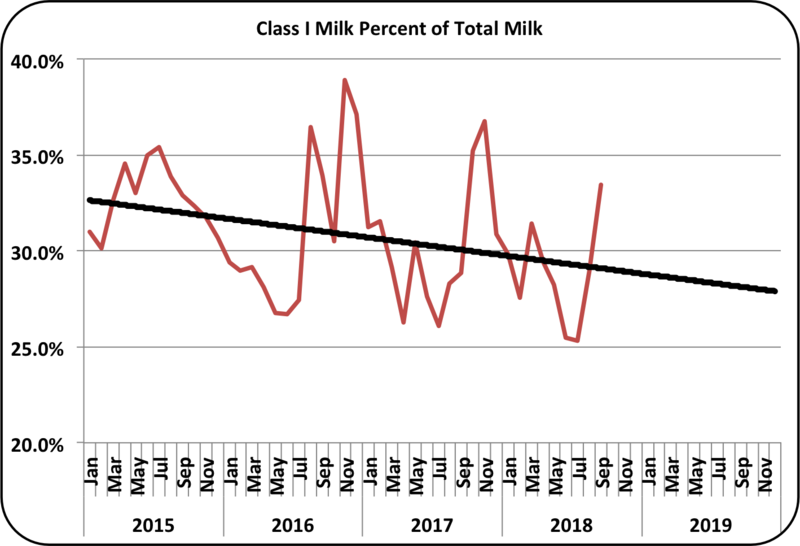 However, the long-term trend of more milk per cows continues and will continue. The only thing that can reduce more milk is lower prices to limit herd expansions and force more producers out. That's a pretty grim statement, but it is incontestable. Where is Class I Milk Crashing? 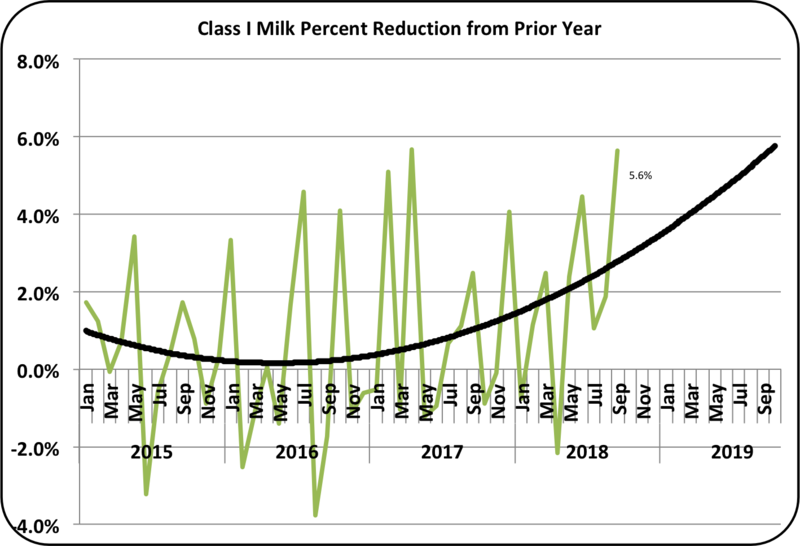 In the prior post, the decline in Class I milk was examined for the U.S. in total. That post has raised questions as to where the impact is greatest. 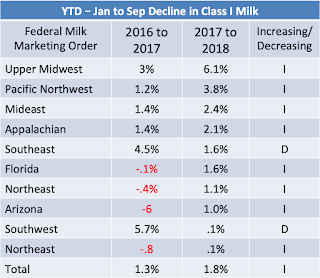 This post will examine the decline in each of the ten Federal Milk Marking Orders (FMMOs). In summary, all FMMOs are seeing a decline in the amount of Class I milk. Some are seeing steady declines while other are seeing accelerating declines. The charts below will examine the FMMOs with the fastest accelerating declines compared to those with a slower decline. The amount of Class I milk in each FMMO is always based on the amount processed. It may not be representative of consumption in that area. Because Class I milk cannot be de-pooled, the numbers represent an accurate portrayal of the declines. In all graphs the same mathematical trend-line has been applied. 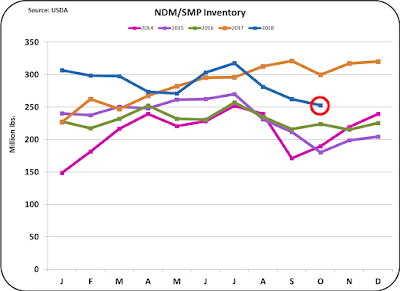 The table below shows the January to September YTD decline for each of the FMMOs. 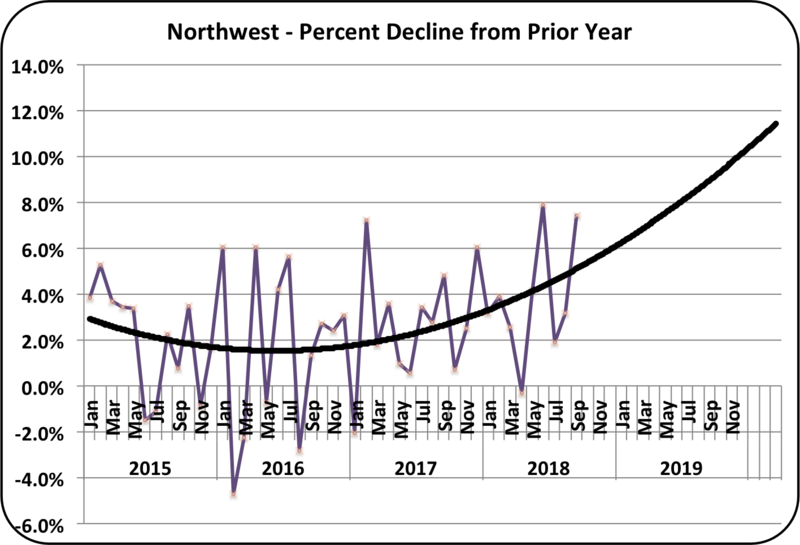 As can be seen, all FMMOs are showing declines in 2018. 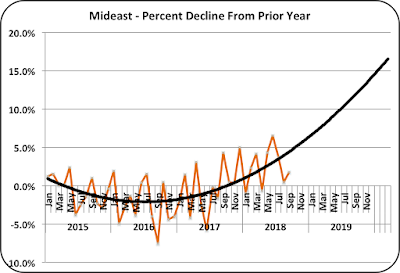 The three with the largest declines are the Upper Midwest, the Northwest, and the Mideast FMMOs. The declines in these three are significantly accelerating. In terms of size, they represent 28% of the total Class I milk. At the other end of the scale is the Southeast FMMO. 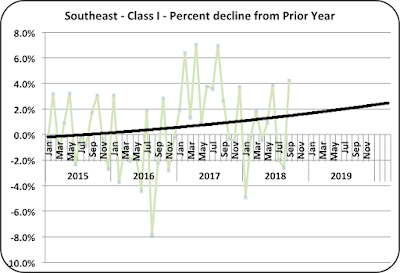 While the Southeast has a steadily declining Class I volume, the decline is not significantly accelerating. That is a good as it gets. 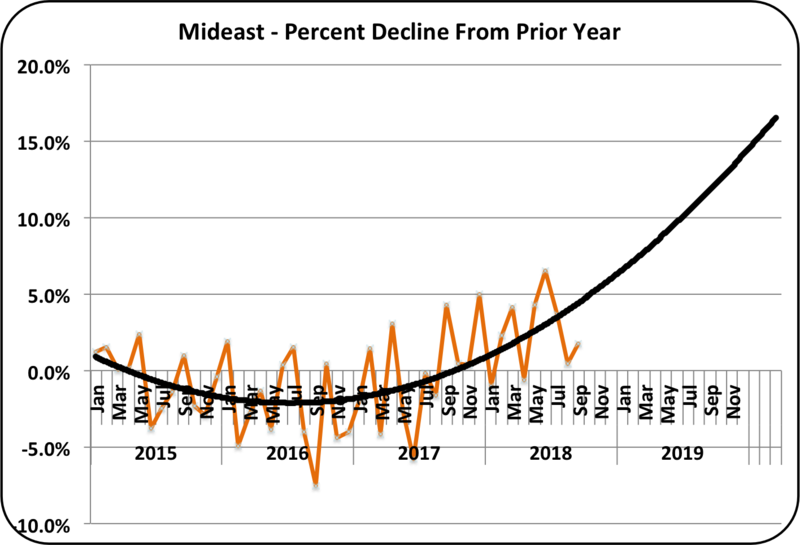 Every other FMMO does have an accelerating decline in volume, but not as rapid decline as the Upper Midwest, the Mideast and the Northeast. What does this mean financially to the producers in these FMMO? 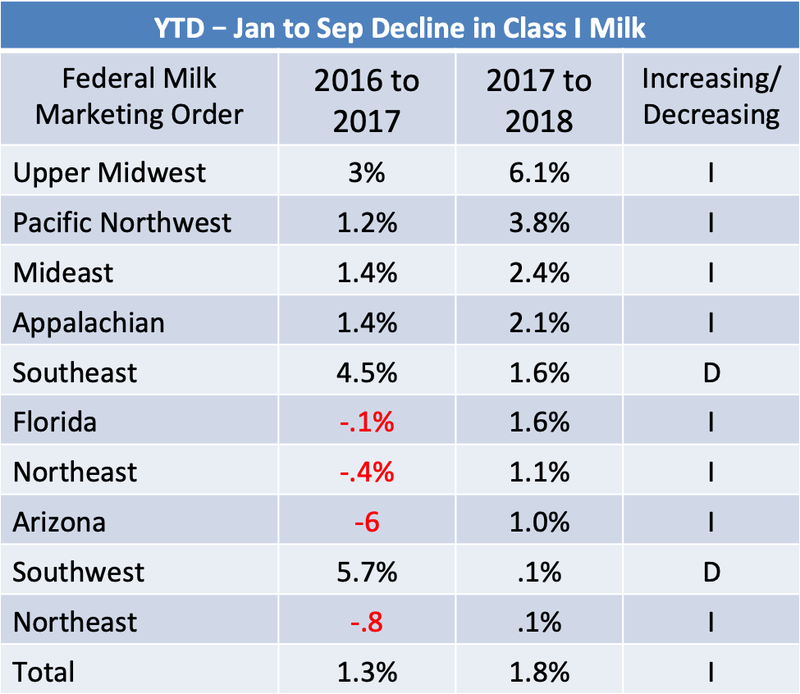 The faster the decline, the faster the average (Uniform) price of milk in the FMMO will drop. What this means in the Upper Midwest is that the Class I impact of keeping the Producer Price Differential (PPD) positive will diminish. The frequency of a negative PPD will increase. Typically many of the producers will de-pool when the PPD goes negative. 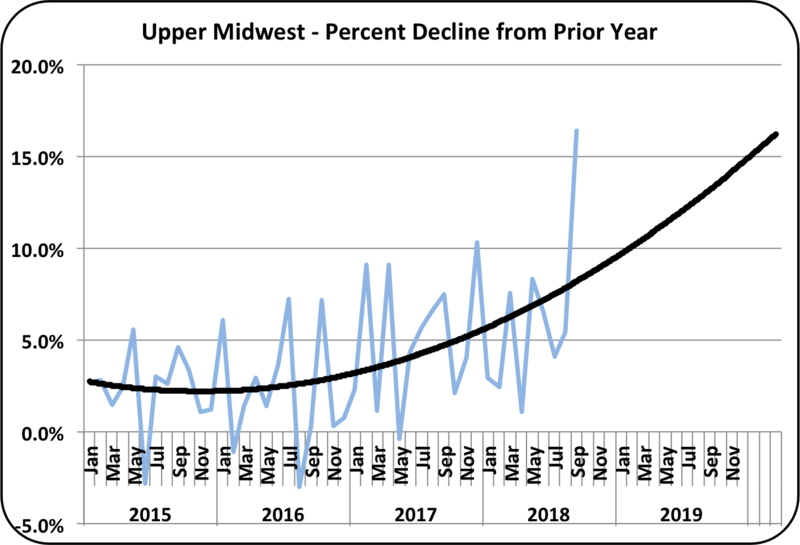 Much of the milk in the Upper Midwest is already being de-pooled. 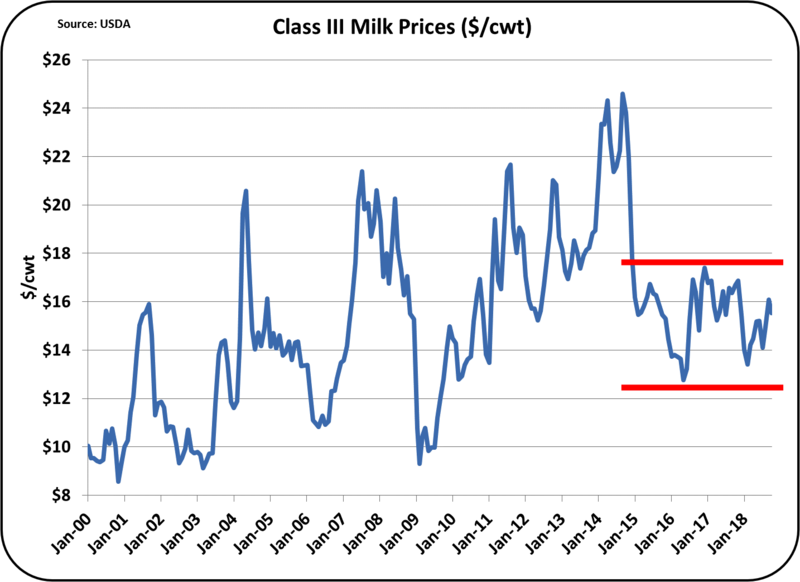 With the declining amount of higher priced Class I milk, de-pooling of Class II, III, and IV milk will expand. Class I cannot be de-pooled. 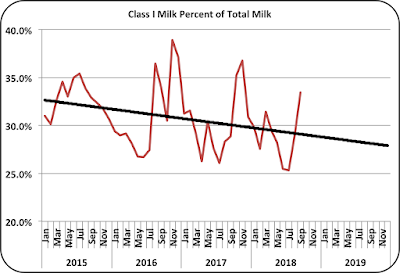 The acceleration of the decline in drinking milk has been reviewed at least three times in this blog; May 28, 2018, June 27, 2018, and October 26, 2018. 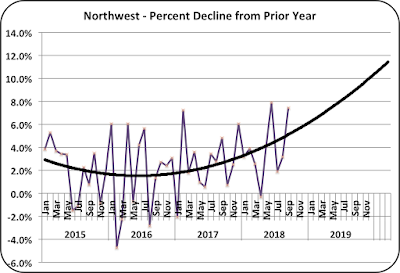 There is not doubt that the decline is accelerating. Chart V below expresses the change in a slightly different way. 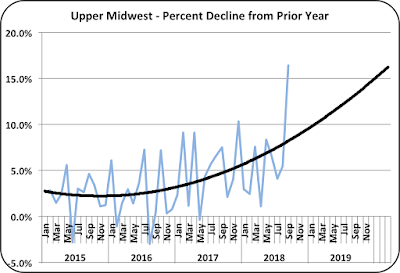 It shows that actual decline in millions of pounds for the Upper Midwest. In January of 2014, 326 million pounds of milk were processed as Class I. 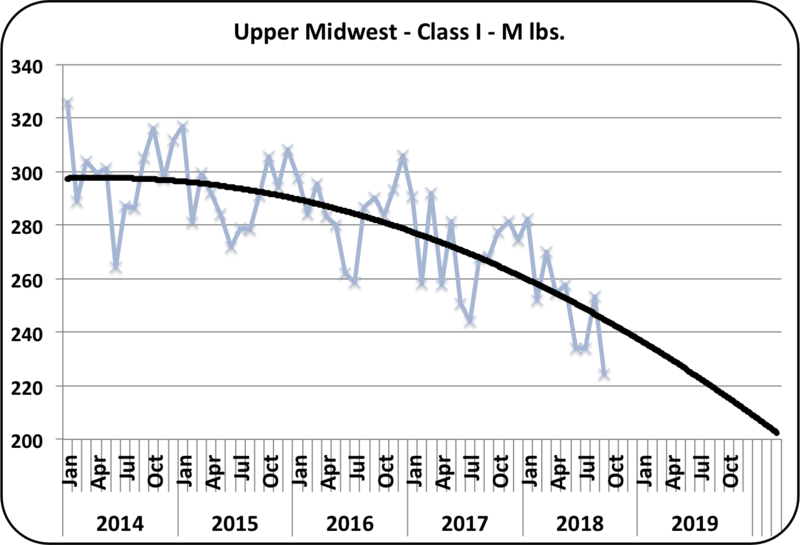 In the most recent month, September 2018, just 224 pounds were processed as Class I, a 1/3 reduction. 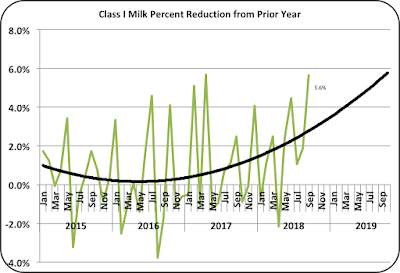 There was a recent article published to show that the growth in Class III milk for cheese has more than offset the loss of fluid milk. The author used data from 1975 through 2017 based on per capita consumption. While his charts are correct, during this time population growth has slowed, the growth rate of cheese has declined from 6% in 1975 to 2% in 2017, and the decline in milk consumption has accelerated. 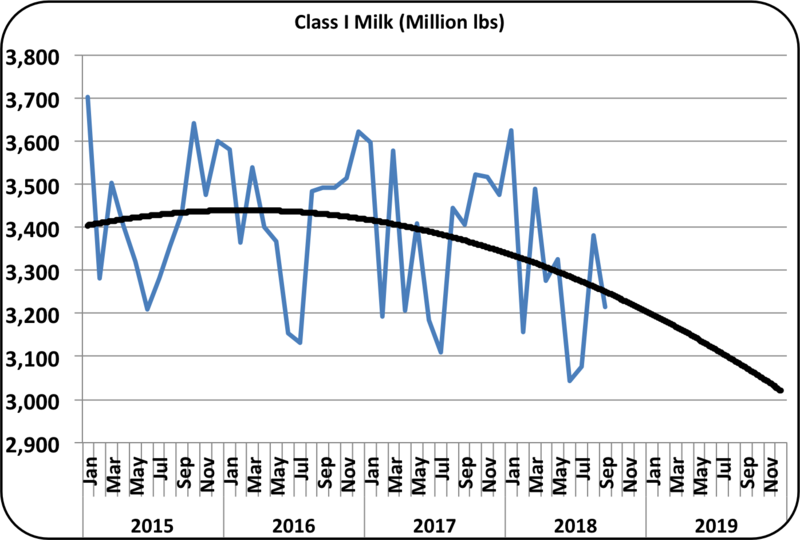 The current decline in Class I milk is a game changer for the U.S. dairy industry and will impact the entire industry. The facts must be accepted so proper planning can be done.